Bryson DeChambeau fired an eight-under 63 to establish a four-stroke lead going into the final day of the Northern Trust. The American, 24, carded nine birdies and one bogey as he took charge of the opening event of the FedEx Cup play-offs, his 16-under-par total putting him well clear of Keegan Bradley. Fellow American Bradley carded a 62 - his lowest Tour score since 2013. The New Jersey tournament is the first of four FedEx Cup play-off events. Only the top 125 points-scorers throughout the PGA Tour season are eligible and the FedEx Cup structure means numbers will be cut to 100, 70 and 30 at consecutive events over the coming month with an overall winner decided at September's Tour Championship. 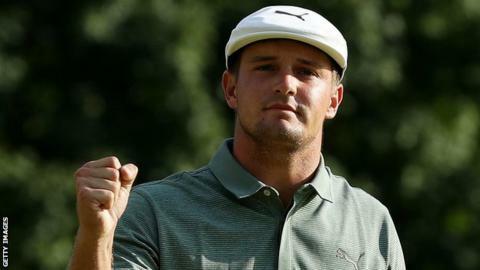 DeChambeau is seeking his third career win this weekend, following his triumphs at the 2017 John Deere Classic and this year's Memorial Tournament. Australian Cameron Smith and Tony Finau were tied for third on 11 under with Billy Horschel and Adam Scott a shot further back. Overnight leader Brooks Koepka, who has won two majors this year, fell back with a one-over-par 72. He was one of a group of seven players on nine under that also included Jordan Spieth and Phil Mickelson.